While East Lothian can make fair claim to the best place to live in Scotland, the ‘Hill Country’ of Gullane is the most desirable address in the county. And while there are some very fine houses on Hummel, Nisbet or Whim Roads, the sine qua non is Hill Road itself. EH31 2BE is just a dead-end. But its steeply rising curve strings mansion after mansion along spectacular views out over a sandy tangle of bents and beach, a choppy ‘Sea of Scotland’ and a magnificent sweep of Fife along the whole horizon. Forth Lodge; Dilston; Coldstones; take your pick—they’re all impressive in their Victorian or Edwardian architecture, tastefully separated from one another by plenty of well manicured space. And while none are identical—indeed they provide a smorgasbord of designs that could busy an architecture student for months—they do provide aesthetic coherence, speaking of an age of tasteful elegance rather lost in the tract home of today. Oh, I almost forgot—they’ll each set you back a serious seven-figure sum before you have to start worrying about how you’re going to furnish eight bedrooms and find a maid. Nestled near the top on the view side is the wonderful Cotswolds-looking (actually local honey-coloured Rattlebags stone) pile in the Arts and Crafts style called Whatton Lodge. Designed in 1910 by J.B. Dunn as the earliest of three in this style (Lorimer’s Corner House and Coldstones followed in 1912), it was built for Sir Harold Jalland Styles as his main home. Succeeding Joseph Bell (Conan Doyle’s model for Sherlock Holmes) as surgeon at the Royal Hospital for Sick Children, he brought aseptic surgery to Scotland and made major contributions to the treatment of breast cancer and TB. Of all the houses on this secluded street, this is perhaps the most unspoiled—no modern garages or extensions; absolutely nothing to spoil its century-old pristine style. 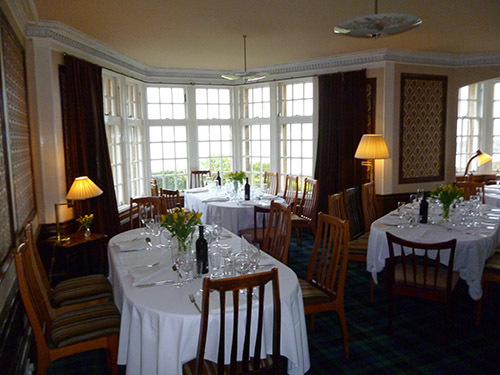 But even better is the interior, in which dark wood panelling and extravagant flock wallpaper are still in place. The panelled doors are all original with their bulky brass door fittings. Decorative cast-iron grates are in place in the open fireplaces. Unusual Vitruvian scroll and plaster cornices still decorate the ceilings. 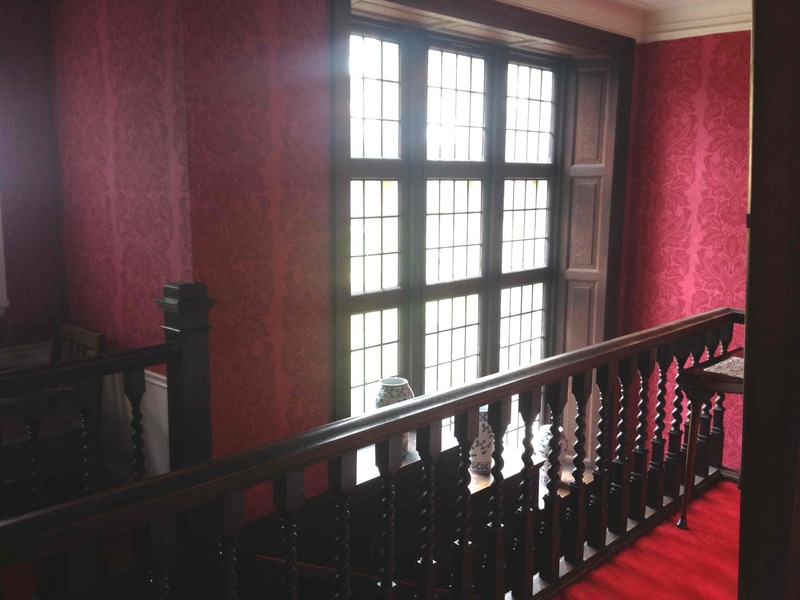 It is so authentic that three film crews have used it for Edwardian scenes with little beyond some furniture required to make it look authentic. “So“, you are saying to yourself “what is all this leading up to? What captain of industry or robber banker has set himself up in this nice little earner to gaze down on the peasants from its lofty heights?” Actually, that’s the best bit of all. Immediately after WW2, the house became vacant. Plans to nationalise Scotland’s health services faced a last minute threat from an unlikely source—workers in the newly-nationalised coal industry. The Miners’ Welfare Fund wanted a new convalescent home and had hit upon Whatton Lodge, with its salubrious beaches, golf courses and other recreation nearby, as ideal for their purpose. Also, such a move ran against Bevan’s health policy which was to bring everything into the new NHS. Papers in Scotland’s National Archives reveal an additional snag: grand houses like this on Hill Road had feu conditions for use solely as family homes – and this was to be a convalescent home for up to 20 miners. Sir Harold’s nearest neighbour on Hill Road was his former assistant Sir John Fraser who died the year after Stiles. Fraser was the finest surgeon of his generation and had become principal of Edinburgh University in 1944. Other neighbours asked their views on dropping the feu condition and were uniformly shocked. According to one Hill Road resident: “The precedent, to allow institutions of this kind to spring up in a locality famed throughout the world as a holiday resort primarily for golf, would to my mind be disastrous”. The chances of the nimby nobs fighting off these grubby miners from appearing in their neat back yard looked good. But public pressure grew on Arthur Woodburn to act, although he had no powers to intervene as Secretary of State. Finally, a letter on behalf of Lady Fraser and her son Sir James broke the logjam. They said they had no objection “as they feel certain that had Sir John been alive, he would have been the last person to stand in the way of such a project”. 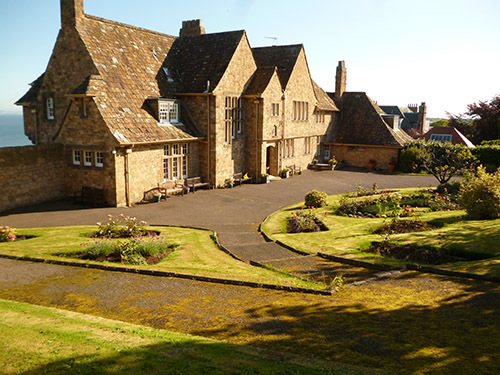 And so, since 1948, Whatton Lodge has been the Scottish Miners’ Convalescent Home, enjoyed by thousands of those stalwart men (and their wives and widows) who once made a hard living dragging what was once our main energy source from the bowels of the earth. And even though the last deep mine closed over a decade ago, there are still hundreds who come to enjoy the company of their old comrades and feel, for once in their lives, they are living like toffs. Which they are, and long may they do so. This entry was posted in Community and tagged miners welfare; arts and crafts; hill country. Bookmark the permalink.